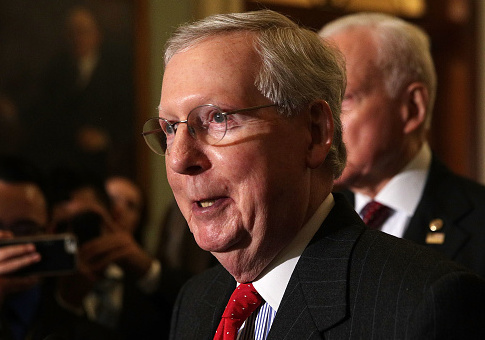 Senate Majority Leader Mitch McConnell (R., Ky.) cancelled August recess Tuesday, saying Democrats have engaged in "historic obstruction" of nominees and legislation. McConnell has made confirming President Donald Trump’s nominees a top priority, but has faced stiff opposition from Democrats, who have delayed dozens of political appointees. In a statement Tuesday, the majority leader said he wanted to use the recess to confirm nominees and pass appropriations bills. "Due to the historic obstruction by Senate Democrats of the president’s nominees and the goal of passing appropriations bills prior to the end of the fiscal year, the August recess has been canceled," McConnell said. "Senators should expect to remain in session in August to pass legislation, including appropriations bills, and to make addition progress on the president's nominees." The statement also said senators will likely have a state work period at the beginning of August before coming back to work in the Senate. Democrats have invoked cloture on Trump’s appointees, demanding 30 hours of debate rather than deferring to the president’s nominees. Sen. James Lankford (R., Okla.), chairman of the Financial Services Appropriations Subcommittee, has pushed for so-called gridlock reform to change the rules and allow nominees to get a floor vote more quickly. The delays have affected the confirmation of various appointees, from judicial nominees to potential ambassadors. Lankford said last month that Democrats have slowed down all work in the Senate. "The Senate can’t walk and chew gum at the same time," Lankford said. "So, if you’ve got post-cloture time pending on a nominee, you can’t get on appropriations bills, you can’t get on legislation. Even things that are on the hotline right now — that should be able to come out and have a straight floor vote — you can’t get out." McConnell also said he wants smaller appropriations bills rather than an omnibus spending bill, according to the Washington Examiner. He said conversations with Democrats about appropriations have been "constructive." This entry was posted in Politics and tagged Mitch McConnell, Senate, Senate Democrats, Trump Administration. Bookmark the permalink.